Apartment 528: New Design for All Collection! New Design for All Collection! Umbra Loft is the newest addition to Target's Design for All series. Umbra combines technology and whimsy to create a fresh look with a flair for the dramatic. 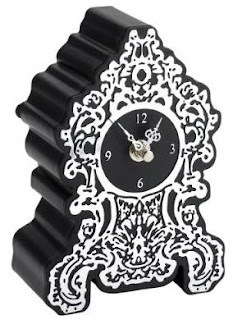 The candleholders and jewelry boxes are cute but Umbra's clocks are my favorite. From the small mantle clock (right) to the 4ft long sweeping wall clocks, they're all adorable! I'd stop in now before the collection's gone. Target's Design series never last for long!